To further the goals of creating a repeatable, robust and scalable global business it is important to describe the principles, and strategy for organizing people. This document sets the goal of describing the form and function of the macro-organizational design and principles that should be considered when structuring or expanding the organization. This document is a living document and should be revisited and used as a basis to propose changes. There will be exceptions to the model, but this is meant to provide guidance and clarity on common patterns that should be used when the business condition supports it. The Organization shall create Functional Teams for shared functions that primarily operate outside the Squad structure. Individuals from the Functional teams may represent the function as required in the Squads as a ‘Squad Community’ member. They will add value as needed, rather than on a routine basis. The creation of functional teams will be avoided in preference of dedicated Squads when the business case allows. Example Functional teams could include Data Ops, SalesOps, Sales, Architecture, IT, Support, Marketing, Product or other teams. The Organization shall create Squads as defined as cross-functional groups of individual contributors which collaborate towards a unique portfolio of work. Squads should be constructed as long-lived entities with direct membership for routinely required activities, and access to a community of talent for less common but important activities as required. 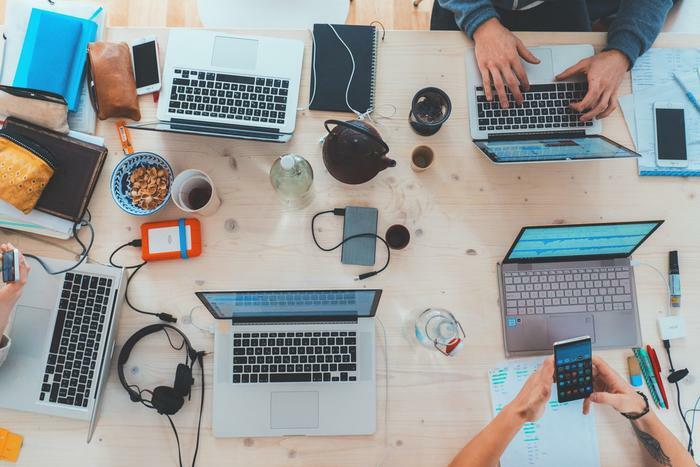 Ideally Squad members will be co-located in the same location, or same remote-work status to create equitable work status among all squad members. Squads may be remote to other Squads. Squads should be enabled as cross-functional groups to independently own and execute against the established charter as much as possible. Squads should have a clearly defined and living document describing their charter, which should outlay responsibilities and business scope of the Squad. Squads should be built as small nimble groups. There is no prescribed size, but if a squad has become too large, it should consider splitting the responsibilities and headcount into two or more Squads to create focus towards specific outcomes. Squads have core members which primarily operate within a single Squad, while other shared roles may have other reporting lines. This is a Matrix design which aligns the cross-functional group towards a common purpose. It is understood that Matrixed Squad members have responsibilities to their Functional Team as well. This should be accounted for in estimating work and managing Squad effort. Squads should be built to deliver against a portfolio of work which includes an appropriate blend of Horizon 1, Horizon 2, and Horizon 3 work when able. Squads are intentionally built to be myopic to enable focus on execution. These individual contributor roles refer to any functional role which supports the execution of a Squad or participation in a Functional Team. Examples include Product Managers, Sales, Marketing, SREs, SWEs, Testing, Analysts, and any other required role. Squads should have an appointed ‘Squad Lead’ - this is a point of contact for the squad, as well as a senior member that can help organize and facilitate day to day responsibilities for the squad. Squad Leads will not have HR Management responsibilities. Squad Leads should be available for consult for professional review of existing staff as well as candidates of their respective discipline to assist the HR Manager. Squad Leads are individual contributors, in addition to helping facilitate the normal operation of the Squad. Squad Leads should help maintain healthy culture, and effective operation of the Squad, while escalating to the supervising Director as required. Squad Leads should have a deep understanding of the Squad’s charter, and how it contributes to the larger business, such that they can succinctly explain it to others both in and outside the Squad. Within the organization, Principals are senior staff which function as an individual contributor within a Squad, but also are subject matter experts, evangelists and thought-leaders for a given function or primary skillset. An example would be a Principal for Testing, or Software Development. Principals will not have HR management responsibilities. Principals will report to the local Director role when able, if organizational scale requires it, they will be managed by a Director. Principals will not act as Squad Leads, since they may not be long-lived with the Squad. Principals should be available for consult for professional review of existing staff as well as candidates of their respective discipline to assist the HR Manager. Principals should be trained to assist in hiring activities and will have significant input in hiring decisions relating to their focus. Principals as needs of the business indicate may move between Squads more often than other individuals to help provide mentorship, support, and cross-pollination of ideas and concepts to further the effectiveness of a given Squads members through guilds, workshops, trainings and similar activities. Principals are meant to have a broad strategic view for the discipline they represent and assist in counterbalancing the myopia of Squads for that discipline. Principals are expected to be active in the development and maintenance of their respective community of practice (or “guild”). Principals interact with the overarching groups such as architecture, etc. to help ensure effective representation for the discipline they represent as required. Principals are expected to be flexible for travel as needed to help mentor and train individuals from other locations as the business needs present themselves. Squads should be directed and managed by a Manager role co-located with the Squads physically, or virtually for a virtual Squad. The Manager role can be filled by individuals with the title of Manager, or Director for example depending on skill and remit and business circumstance. Each Manager should ideally oversea 2-3 Squads each as the situation permits. Management layers should generally be minimized to increase speed, effectiveness, and focus investment in the Squads for execution whenever possible. The Manager role should have HR reporting, staffing, and administrative responsibilities for members of the Squads they are responsible for unless there is a business case for not doing so. The Manager role will be responsible for directing and coordinating work for any members of the Squad which are not direct reports - such as a shared community function such as Technical Support. The Manager is responsible for the health, development and guidance of the individuals within the Squads, and the Squads as a whole. The Manager is responsible for facilitating financial and effort estimation, fact gathering, and reporting to the business on progress of investments, status of Squads, and the unique portfolio of work the Squads they manage. The Manager is responsible for coordinating between the different departments or functional divisions such as Sales, Marketing, Product, and Engineering to help the cross-functional team deliver against the Squad charter. The Manager role is designed to be a counterbalance to the myopia of a squad, and acts as the ‘glue’ to help drive execution. The organization should have at least a single Director co-located with each group of Directors and Squads. The Director should aim to have 10 or fewer reports. Consider scaling horizontally if this is exceeded and conditions permit. The Director should have HR responsibility and oversight over the colocated group. The Director is accountable for health, operational effectiveness, and efficiency of the colocated group to the larger business. The Director is meant to be a strategic construct that creates alignment, drives execution, and fosters a healthy culture. The Director is expected to ensure the organization is effective and successful by taking on responsibility for the implementation of an appropriate strategy that the organization can adapt to. The Director is expected to effectively manage the demands of stakeholders. The Director is expected to give clear definitions of what constitutes effectiveness and success. The Director is expected to ensure the implementation of the strategy and the targeting of resources towards success. The Director is expected to review if their actions are relevant to the organization’s overall goals. 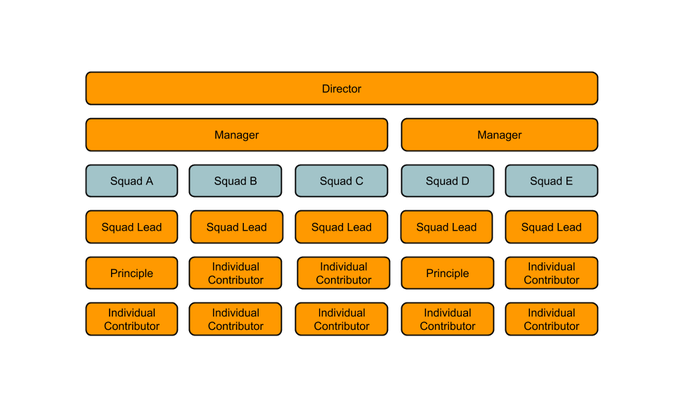 Below is a minimal example Organizational Diagram showing Squad Membership and organization design likely to be found in a given office. The following diagram expands to show a more complex picture that describes Functional Teams and Squads together.